Microsoft SharePoint® Server 2010 allows users around the globe to share documents and information in a collaborative environment. While SharePoint Server provides a rich suite of team productivity tools, in geographically disperse deployments users may still encounter issues which can impose on overall application performance. Riverbed worked closely with the Microsoft technical teams to validate interoperability with SharePoint 2010. 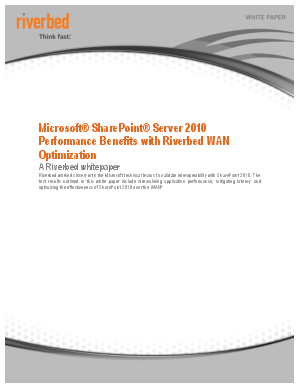 The test results outlined in this white paper include streamlining application performance, mitigating latency and optimizing the effectiveness of SharePoint 2010 over the WAN, resulting in reduced IT costs.